This week in Paris we had our first snowfall. I was at the dentist, and when I came out, the sidewalks were damp from the wet rain that had fallen while I’d had my semi-annual detartrage. Then, as I walked up the rue Montorgueil, the annoying rain turned to little icy bits, then to large snowflakes, dusting everything, from the brick sidewalks, then coating my arms and shoulders. It was so blinding that it drove the communists distributing leaflets back into their headquarters. (And those people are pretty tough…or so they’d like us to believe.) As for me, those snowflakes drove me right into Stohrer, Paris’ oldest pastry shop, because this time of the year—and only this time of the year—they make my favorite little treat: Zimtsterne. I can’t tell you how much I love Zimtsterne. (Well, I could, but it would take up too much bandwidth.) There’s just something about these chewy little stars, spiced with lots of cinnamon, then brushed with a glaze of royal icing that provides just the right bit of creamy sweetness in contrast to the chewy cookie below. Unable to get enough, I usually go back to Stohrer several times during the holiday season, until that final visit, when they sadly tell me that they’re finished making them for the year. I tried making a similar recipe one year, Basler leckerli, from a recipe that a Swiss friend gave me, but one bite into the rock-hard little rectangles nearly sent me running back to le dentiste. So I wait, semi-impatiently, for each December, when the little spiced cookies start to cascade down all around me again. And I thank my lucky stars, that it’s winter, and they’re back. For those interesting in making Zimtsterne, there’s a recipe in my book Ready for Dessert. Do you have a recipe for anything vaguely like this? The Germanic countries really do have the best Christmas biscuits! I was vaguely thinking of making lebkuchen, but Dan Lepard mentioned that you have to leave the honey-dough out for 3-4 MONTHS before they are baked! So that’s no longer on the agenda. Good heavens, there are still European communists? Makes sense I suppose, nothing like ab obsolete ideology to warm the cockles at Christmas time. I second the request for a recipe, these Zimsterne look delightful. Funny. I am here in Paris for work and looked out the window when it was snowing and was shocked by the size of the flakes. I am from NY and I really didn’t expect to see this type of snow here. Thanks for giving me another place to visit this weekend. The photograph you took is delicious looking, mixed with your description and the fact that these are a once a year thing, makes me want to go to Paris right now! It was enough to get me motivated and out the door – to search for a similar treat. Thanks, David! I am eating the Zimtsterne right now, fresh from Germany, and in the meanwhile have translated the original german recipe for you (though with the metric system …. ) ! Enjoy! Beat eggwhites with lemon juice, salt and sugar to a firm meringue. Put aside 3 tablespoons of the meringue, to the rest add the vanilla sugar, cinnamon, nuts and almonds. Cover and refrigirate for 2 hours. Roll out about to about ¾ cm on a sugar-covered surface (you can roll the dough between two layers of cling film to make things easier) . Cut out stars, put them on backing racks and cover with the meringue that you’ve put aside, adding to it some drops of water. Bake in the warm oven at 150 °C in the lowest part of the oven for 15-18 minutes. Take off the racks and let cool while still on the backing sheet. They should be stored in tin boxes and get softer after 1-2 days. You can add a slice of apple (raw) to the tin box where you store the stars to let them get softer. Oh these are fantastic! I had a German executive chef who always wanted to have the pastry kitchen over-flowing with German Christmas cookies and stollen during Christmas. His wife used to be a pastry chef years before so she showed us a bunch of different traditional cookies and these were our favorites. I wish I could taste the Stohrer ones. Beautiful! Zimsterne! I would make them with almonds only, without the hazelnuts, but I actually never make them because the dough is so annoyingly sticky it’s nearly impossible to work with. But one can get quite good ones everywhere in Germany (it may become difficult in Berlin as it is nearly impossible to find a good bakery here. So I probably have to bake my own this year.). Thanks for telling us about these cookies. Does this post mean that your Internet connection problems are finally solved? I hope so! For me this really evokes Christmas, my German grandmother who passed away this year used to make them for the first of Advent. This year we inherited her recipes and cooked one each. They are absolutely fabulous. My favorite even more so then gingerbread cookies. I miss her a lot, especially this time of year. She always made Christmas special. Whip egg whites and sugar to make a usual meringue base. Fold in the rest of the ingredients. Roll into 1 cm thick layer, spread with icing flavored with extra cinnamon. When the icing has hardened using a cookie cutter cut the shapes you want. For some reason we use crescents! The rest of the recipe is unfortunately not annotated this is what it says: Bake for a short while on a medium high heat on parchment paper on a baking tray. Hope you have the opportunity to try this recipe. I can’t wait to try these! They sound so delicious. As always, thanks for letting us in on Paris’s best hidden treasures! I have a recipe from a book I bought when I was in Colmar, it was actually from a book stand in the train station! Do go over to my site and try my sisters recipe for the Leckerli from Basel-land (not the city version) these are phat and more cakey in texture, a real winner. Oh how i wish i had known about this place last winter!! I was living in Paris for 5 months and was in the 2eme all the time. I remember the communists handing out leaflets back then, even . . . what good times. Enjoy Paris for me. I miss it!!! and those Zimtsterne look incredible! Are they supposed to be shaped like a star of david? 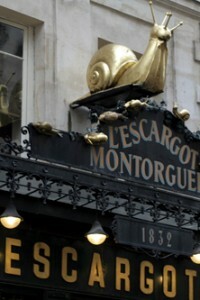 also, anyone had the pain au chocolat au amandes from Desgranges in the 16eme? to. die. for. Zimtsteren is a very, very easy recipe – except for the stickyness of the dough. But the kids here in Germany already make them and they actually always taste good. I am guessing these are like the french macarons. They need to rest in the refriegerator for 24 hours to get soft again ?? I am going to try them with Brazil Nuts (I am in Rio de janeiro). Hope it does them justice… thank you, David! Oh, I struggled with making these (almond version, with meringue topping) one year when I first started baking Christmas cookies, eons ago as a teenager. (the recipe came from some women’s magazine) I remember the dough being exasperating wet and sticky and I had to keep adding powdered sugar. They turned out better than expected, a little primitive-looking but they disappeared first. Haven’t had the patience (or an oven that bakes at 150F) to try them since. Must try them with hazelnuts, that sounds amazing. Here’s another seasonal treat, new to me, that I wasn’t able to research on my latest trip last week: what’s with those fat, puffy gingerbready-looking cookie/cakes in the bakery windows? They don’t look dark enough to taste spicy, and the smooth, shiny crust looks more brioche-like than cake like. David, can you taste one for the team? Wow – they must be good if you can’t get enough (I imagine that you are hard to impress). My fav holiday sweet are buttertarts and this year, I have my perfected recipe to share with all my guests (but mostly just with myself if I can get away with it!). Hmm, Dana, that butter tart looks amazing. But I don’t know about uniquely Canadian: it looks very much like an old Scottish recipe for Ecclefechan butter tarts. Except the Scottish ones sometimes have walnuts as well as raisins, and vinegar used to be used instead of lemon juice, but I suspect that was because lemons were so hard to get hold of back in the day. Perhaps the Scottish immigrants brought their tarts with them to Canada? Not a great photo but you’ll probably recognize have seen these–they’re in boulangeries and even Monoprix. Oh these do look lovely and so festive too!! Congrats on the Blog Envy thing also – I am still intending to make that ice cream, but i can’t seem to find a part for my ice cream machine. I’m thinking of just buying a new one as I fear something might have gotten lost in the move and I hated that machine with all its stupid parts anyway.. am i justified in just getting a new machine?? and of course, if you have favorites, please recommend away! happy holidays! I have been looking for a recipe for zimsterne! I’ve never had them before, but I am so excited to read your thoughts on the. I’ll have to try one of the recipes provided in the comments. Zimtsterne are one of my fondest memories of growing up in Germany. I’ve only once ever tried to make them and I ended up with rock hard cookies. That was discouraging, but it’s been a few years, so I’ll have to give it another go this season. Thanks for bringing back such lovely memories! The zimtsterne I made so long ago were really hard after they cooled but became softer and more irresistible over about a week. Seal them in an air-tight container with a slice of apple — a step probably unnecessary in Paris’s winter dampness. Alisa & Maya: Thanks for passing along those recipes. I’ve considered trying them out, over the years, but there’s something to be said for waiting until each December then heading over the Stohrer and picking up a little paper bag of them. They sell them in big boxes, but I only bought six, certain that would be enough. I ate them right after taking the photo and am heading back tomorrow for more! I’ve looked up the recipe for this cookie and there seem to be two schools of thought about this cookies ingredients. One looks more like a frosted nut and cinnamon sugar cookie (probably the Americanized version), the other more like a frosted meringue based cinnamon nut cookie (most likely the authentic version). Both are likely very good, though different. None of them said handling the dough was easy. I’m loving the looks of them, but like you, if I had a source that made them the way I liked..I’d wouldn’t bother either. Plus, like you said, it gives you something to happily anticpate once a year. The further our youth is behind us, anything we can do to recapture that anticipatory excitement around the holidays, the better! These look good… In Lubeck they make Zimt Marzipan stars covered in milk chocolate. I bought ton of them last Christmas… Delicious! Searching Zimsterne on Google yielded 9,430 hits, most of them looking like recipes. Thanks for the great tip, I can’t wait to make some. Spelling it right yielded 143,000 hits. Regarding a recipe for cookies like this (I think) there is one in the Rose Bakery cookbook. I made them once—a mess but truly delicious! This post is so perfectly timed! As are the comments! 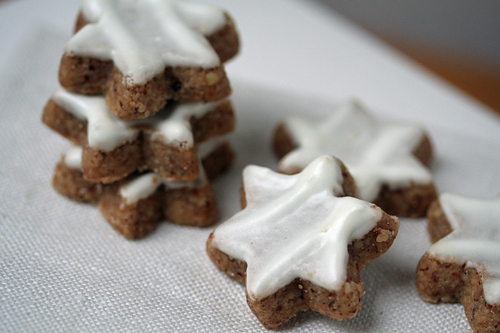 I love German spiced cookies, and was considering making some this week. I am grateful for the inspiration (and subsequent recipes). Thank you!! How do you stay thin??? You have probably posted about it before and I missed it ;). I am dying to make more desserts more often but am only unleashing the leash on Friday because I like to have a nice cake (usually) for Friday dinner, Saturday and Sunday, and whatever is left by Monday I give away (to all those people who don’t know anymore how to bake or what is home-made cake…), and then I wait again to Friday. It’s a vicious cycle. 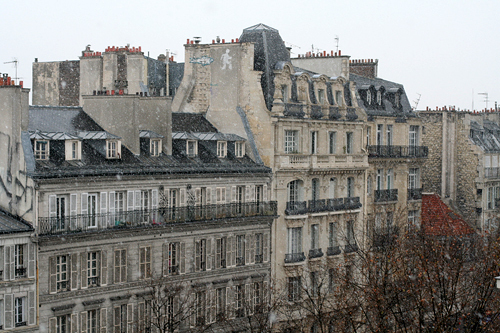 I remember the first time I was in Paris and the snow started to fall – magical. But the days prior and following were ghastly cold – shame I didn’t have any Zimtsterne to pass the time I spent indoors! 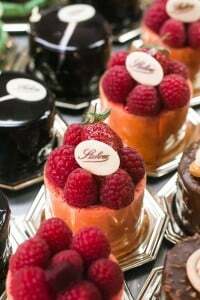 But I did find a whole lot of joy in Paris’ pastries and beautiful chocolats… enjoy the charm of the city, finicky or otherwise, I miss it! Stohrer is my favourite place for Kugelhopf. Christmas. Of course, they won’t taste as good as the freshly baked version. Love your website-happy holidays from a fellow expat! Yes, what is it about French websites and music?! Is there a fix in between website designers and employers so that anyone who surfs at work is busted by the noise? What little bits of delight these cookies sound! We recently had our first snowfall in Boston and suddenly I was craving hot chocolate. Certain foods are enjoyed only when weather permits…Enjoy! While you are writing about cookies, I have a cookie chemistry question. I recently made a ginger cookie and the recipe called for dissolving the baking soda in boiling water. This was then added after half of the flour/spices had been combined with the creamed butter and sugar. I know you don’t comment on other people’s recipes but wonder if you could comment on this method…I have never seen it before. Preheat oven to 150C. Mix ground almonds, icing sugar, honey and egg whites (unbeaten) to form a smooth dough. Roll out approx 1cm thick on a little icing sugar in portions (I broke dough into four). Cut into stars with star cutter (NB dough is a little sticky so wash and dry cutter occasionally and/ or dip in icing sugar before cutting each cookie to avoid losing corners). Place on trays covered in baking paper. To make icing whisk egg white and icing sugar (and Kirsch if desired) until thick and syrupy. Ice uncooked Zimsterne with this, using chopstick or similar to get it into each corner and avoid splattering the icing all over the tray. Bake for 10-15 mins. Zimsterne will still be quite soft. Cool on cooling rack, before placing in airtight container. Will keep for a month or more if any survive that long. Update: Actually, I couldn’t wait! I went out and bought ground almond powder. All I need to do now is find a star mold in Paris. My sister and I are planning a big day of Christmas baking next weekend and these look good enough to add to the list. Do the Stohrer cookies have a hint of candied orange peel? I just made some Alsatian almond spice cookies the other night, and the combo of nut, cinnamon, and citrus zest is pretty good. The candied zest seems to help keep them on the softer/chewier end of the spectrum than previous attempts at nut flour cookies I have made. Just a word of warning–if you do use citrus zest, make sure to dice it very fine or throw it in the blender, or the larger chunks will foul up your cookie cutter and make for messy cookies. How about a recipe in standard measurements? My wife just made these and they turned out great. It’s from the Better Homes & Gardens “Cookies for Christmas” book from 1985. You should see the hairdo on the editor. I had to look up filberts, I guess that’s another name for hazelnuts. * In a mixing bowl stir together almonds, filberts, flour, cinnamon and nutmeg. In a small mixer bowl beat egg whites till soft peaks form. Gradually add sugar, beating till stiff peaks form. Fold the nut mixture into the beaten egg whites. Cover and let stand for 30 minutes to let the nuts absorb moisture. * On a surface lightly sprinkled with powdered sugar, roll dough 1/4 inch thick. Cut with a floured 1 1/2-inch star-shape cookie cutter. Place on a well-greased cookie sheet. Bake in a 325-degree oven for 10 to 15 minutes or till done. Remove and cool. * For frosting, in a bowl combine 1 1/2 cups sifted powdered sugar and enough of the milk to make it of thin spreading consistency. Tint with food coloring if desired. Spread on cookies. Makes about 48. With all these recipes to try you may just have to make a batch some time. Hmph, these cookies are delicious, but mine came out crunchy – not chewy. What did I do wrong? @samantha: No, Pfeffernüsse aren’t the same like Zimtsterne, even not similar. Pfeffernüsse: Lebkuchenteig(Lebkuchendough) better said Achener Printen Teig. you can get Zimtsterne from September on here in Germany, as well as your Pfeffernüsse, Pfeffernüsse you can by the whole year through. Zimtsterne: quite simple: Hazelnuts (never use almonds, that won’t work), Eggs, Sugar and Cinnamon. You have to beat the egg white with sugar till it is very very shiny (? shiny/glossy =glänzend= it looks like their would be a little fat-coat on it or, better said, if you take your mixer out of the eggs, you have to see little peaks). 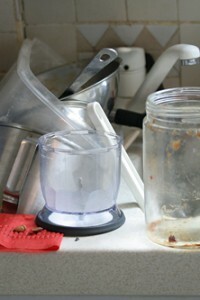 Once your dough is ready, take it into the refrigerator for a while, (1/2 – 1 hour?) and then roll it between to saran wraps, that helps a lot to avoid sticky fingers/kitchen/floor/ a nervous breakdown. Don’t bake the Zimtsterne for too long! They are ready, when they seem to be still raw in the middle. If you want the icing being baked as well, you should remove the Zimtsterne from the oven, when the corners of the stars become bright- which means, that almost the whole Zimtstern is rare at this moment. 180 Grad (which is 325 degree), short! really short! time, sth. like 8 minutes (15 is really far too long!). Let them rest in a cool place (sleeping room), mind out hungry husbands and kids, do the topping on the next day, perhaps 50 Grad (? sth. like 120 degree?) a few minutes, and the let the Zimtsterne dry for a few days. Then the will be perfect. By the way: DON’T! add lemon juice into the topping, that makes the topping chewy, and the topping of the Zimtsterne has to be crunchy. and.. I don’t want to be a Mrs-know-it-all, but…..(sorry) Basler Leckerli(s) are not comparable to Zimtsterne as well…. These are as well Lebkuchen, and Zimsterne and Lebkuchen are like elefants and dogs. If you are lucky to get some, try the Basler Brunsli, they are at least a little comparable to Zimtsterne, not really, but a little. and they taste like a little peace of heaven- chocolate, nuts ( again only haselnuts) eggwhite, short baking time, drying time in a cool place, chewy, delightful, heavenly, amazing- but: hard to get. really. Nobody bakes them anymore, even not in Germany, in my city (munich) the are not sold any more- so I have to bake them on my own. Once you know how they work, its easy but a little painfull. In my neighbourhood people come to me and ask me to sell them Basler Brunsli (in advent, traditional high-end-backing-time here)- so, if you’ll find them in a bakery,try them, they are really sensational, and you won’t need your dentist. @ claire: yes Lebkuchen need that long time. These are the single “plätzchen” (we call these cookies for Christmas Plätzchen) which have to be prepared in September, Honigkuchen has to be baked in November. But you can also bake the dough and let the Lebkuchen stay for 10 – 12 week. But you need hirschhornsalz, which is really hard to get in other countries than Germany and Austria. A book of essays by the prolific German humor writer Loriot made a strong impression on me growing up. It had a collection of recipes, including one for Zimtsterne. It involved egg whites, almonds, sugar, 6-8 hours in the oven, and a fret saw. There’s actually a place in Berlin, Die Rebellion Des Zimtsterns (The Rebellion of the Cinnamon Star), on the Schlesische Srasse, where you can get them year-round. It’s odd to see co-workers with these yummy treats during lunch in the summer, as I had previously only seen them in the winter. Sadly, it’s not a bakery, otherwise it would be an awesome bakery. Can’t wait to try your version though (with your book waiting under the tree).